This vital addition to the Routledge History of Economic Thought series surveys arguably the most important country in the development of economics as we know it today – the United States of America. A History of American Economic Thought is a comprehensive study of American economics as it has evolved over time, with several singularly unique features including: a thorough examination of the economics of American aboriginals prior to 1492; a detailed discussion of American economics as it has developed during the last fifty years; and a generous dose of non-mainstream American economics under the rubrics "Other Voices" and "Crosscurrents." It is far from being a native American community, and numerous social reformers and those with alternative points of view are given as much weight as the established figures who dominate the mainstream of the profession. 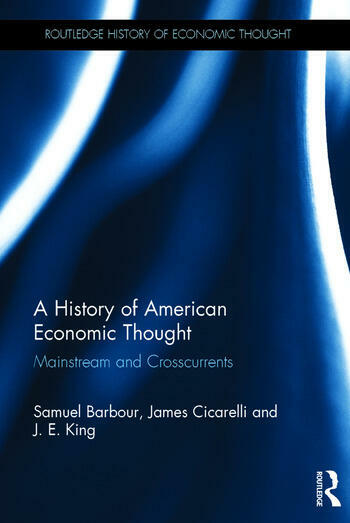 Generous doses of American economic history are presented where appropriate to give context to the story of American economics as it proceeds through the ages, from seventeenth-century pre-independence into the twentieth-first century packed full of influential figures including John Bates Clark, Thorstein Veblen, Irving Fisher, Paul Samuelson, and John Kenneth Galbraith, to name but a few. This volume has something for everyone interested in the history of economic thought, the nexus of American economic thought and American economic history, the fusion of American economics and philosophy, and the history of science. Samuel Barbour studied economics at Roosevelt University in Chicago and teaches community college classes and writes occasional thought pieces for publication. James Cicarelli is a Professor of Economics at Roosevelt University and is co-author of Distinguished Women Economists and "Back to the Future of Economics." J. E. King retired from LaTrobe University, Melbourne, Australia, in July 2013, and was appointed Emeritus Professor in August 2014. His continuing research interests are in the history of heterodox economic thought, particularly Marxian political economy and Post Keynesian economics.